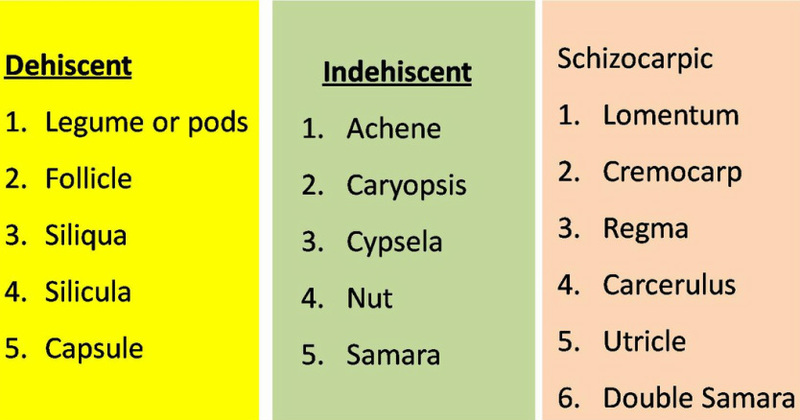 Seed and fruits (broadly classified). : Fruits to be classified into simple (dry and fleshy), aggregate and multiple. Significance of seed and fruit formation. The fertilized ovule increases in size and develop into a seed. The ovary develops into fruit after fertilization and thus morphologically the fruit is ripened ovary. 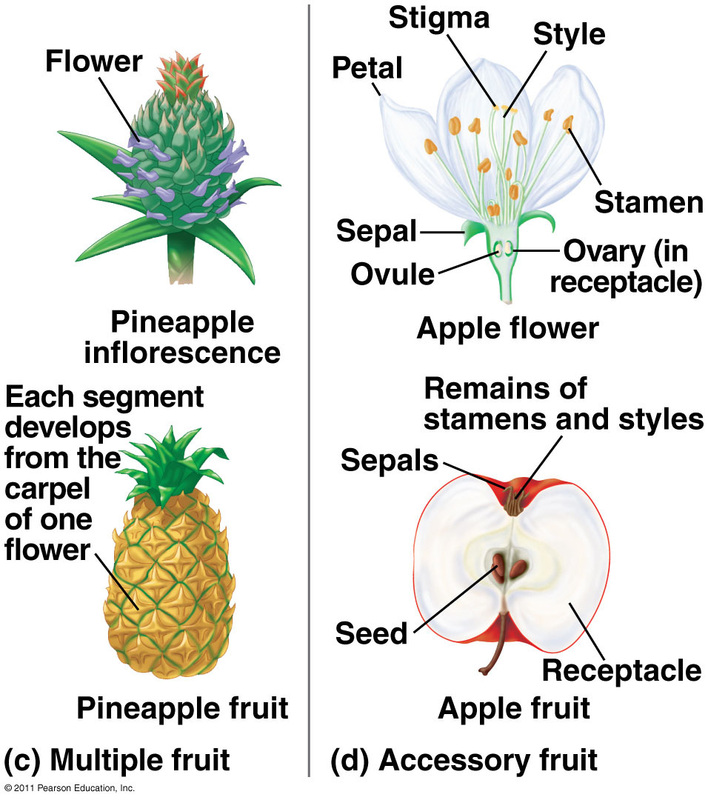 The fate of various parts of the ovary in the formation of fruit is summarized below. The fruit is a mature or ripened ovary . 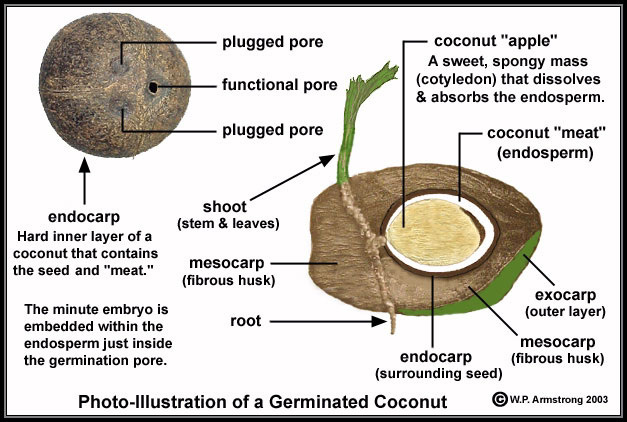 A fruit consists of pericarp, that develops from the ovary wall, and seed derived from ovule. The pericarp may be thin or thick and is usually differentiated into an outer epicarp, a middle mesocarp, and an inner endocarp. But in dry fruits, the pericarp is undifferentiated and is usually papery or woody. When a fruit develops exclusively from ovary, it is said to be true fruit. Examples: Mango, Tomato, Pea etc. When an addition to the ovary, some other floral parts also participates in the formation of the fruit, then it is known as false fruit. Those fruits which are derived from a single carpel or more than one fused carpels of a flower with or without participation of accessory parts are known as simple fruits. These fruits may be divided into the following categories. These fruit develops from mono or multicarpellary, syncarpous, superior ovary. In these fruits, endocarp is hard and stony so these fruits are also called stony fruits. Examples : cherry (Prunus spp. ), olive, coconut (Cocos nucifera), peach (Prunus persica), Mango (Mangifera indica) and plum (Prunus domestica). These fruits develop from mono or multicarpellary syncarpous ovary. Ovary may be superior or inferior, Placentation is axile or parietal. In these epicarp is thin and seeds are embedded in fleshy part. This fruit develops from bi or multicarpellary syncarpous inferior ovary. The rind and fleshy pulp are made up of thalamus. The main part of ovary is hard and dry and remain inside the fruit. Seeds are present in it. This fruit develops from multicarpellary, syncarpous, superior ovary. Epicarp of these is made up of thick rind which is leathery and many oil glands are found in it. Mesocarp is white fibrous structure which is attached with epicarp. Membranous endocarp projects inward and form many chambers. Many glandular hairs are present on the inner side of endocarp. These glandular hairs are only edible parts. Examples: This fruit is specially found in plants of Rutaceae family. eg. Orange, Lemon, Citrus fruit. These fruits develop from monocarpellary, unilocular, superior ovary. It is generally long and multiseeded fruit. 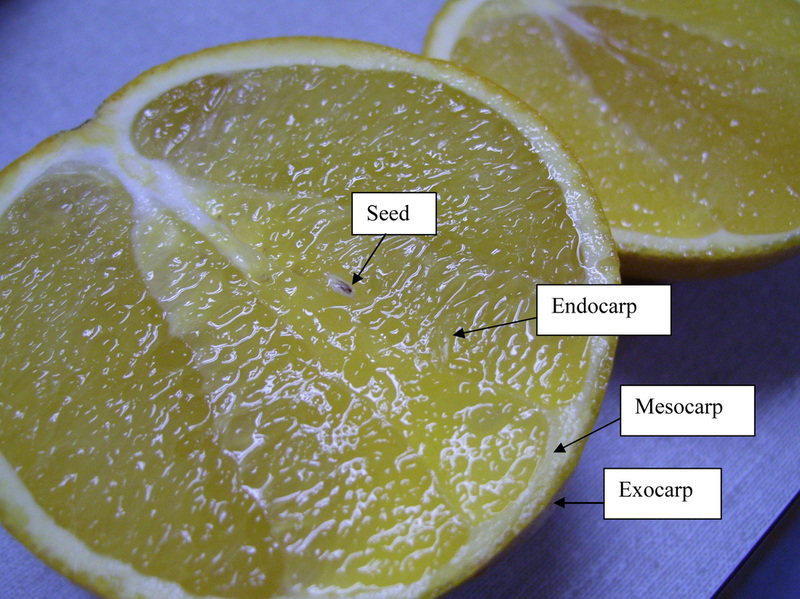 Dehiscense of fruit occurs at both sutures i.e. Dorsal and ventral side. It is also multiseeded fruit which develops from superior unilocular, monocarpellary ovary but the dehiscence of it occur only at ventral suture. This fruit develops from bicarpellary, syncarpous superior ovary with parietal placentation. Dehiscence occurs at both dorsal and ventral suture and starts from lower part and proceeds upward. Due to formation of false septum ovary become bilocular. On false septum, seeds are attached, This type of fruit is found in Cruciferae family. eg. Mustard. A dry dehiscent fruit derived from two carpels fused together to form a flattened pod with two loculi separated by a false septum. The seeds are exposed on the septum as the two valves separate from it, from the base up. Siliculae are similar to siliquae, except that they are as broad or broader than they are long. The fruits of shepherd's purse (Capsella bursa-pastoris) are an example. The separate carpels of a true capsule were originally fused together to form the pistil or gynoecium. They separate along the septa or along the locules between septa. It is a small fruit containing a single seed. 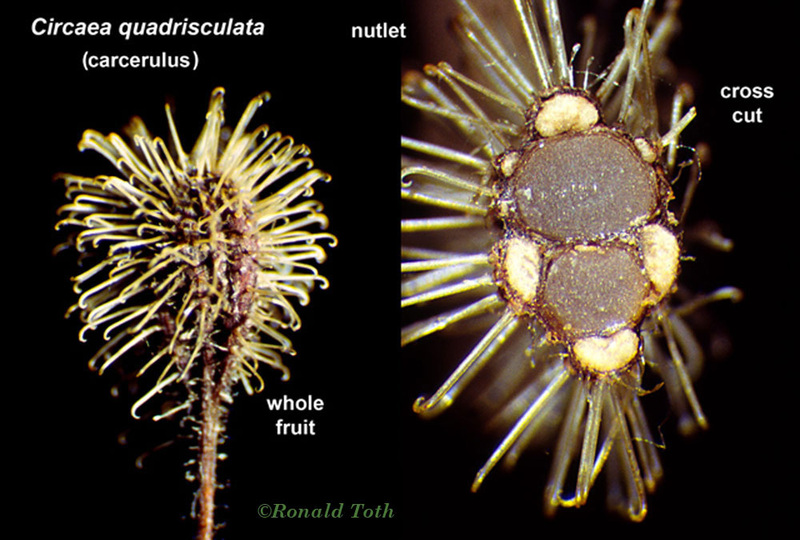 The seed is attached by a funiculus, but the seed coat is free from the inner wall of the pericarp. The seed is essentially free within the pericarp wall, except where it is attached at the placenta. The achene is the typical fruit of the sunflower family (Asteraceae). 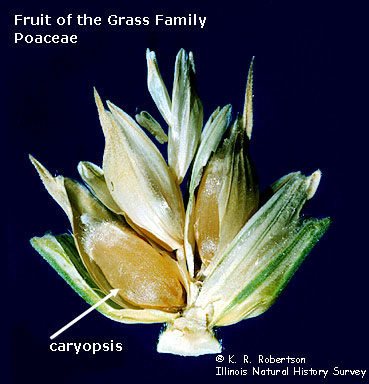 Example : These fruits are present in family gramineae (cereals and grasses). Wheat grain or rice grain is a caryopsis fruit. A Cypsela is a single-seeded dry indehiscent fruit that develops from a one part inferior ovary (on the stalk side of the flower). A fruit similar to an achene except that it develops from an inferior ovary and thus also includes noncarpellary tissue. This type of fruit is traditionally considered a pseudocarp. A dry indehiscent fruit that is usually shed as a one-seeded unit. It forms from more than one carpel but only one seed develops, the rest aborting. True nuts include the acorn, hazelnut, and beechnut. A Samara is an independent dry indehiscent fruit which has part of the fruit wall extended to form a wing (i.e. not a winged seed inside another type of seed pod). Fruits are constricted or divided in one seeded mericarp, after maturity these are separated with each other. Eg Tamarind, Cassia fistula, Mimosa pudica, Archis hypogea, Desmodium. This fruit develops from tri to pentacarpellary, syncarpous superior ovary. Split longitudinally into one seeded parts equal to the number of carpels. It is a dry fruit which develops from multi carpellary or bicarpellary, syncarpous, superior ovary. Number of mericarp is more than locules because of formation of false septum. It divides into four one seeded locules. 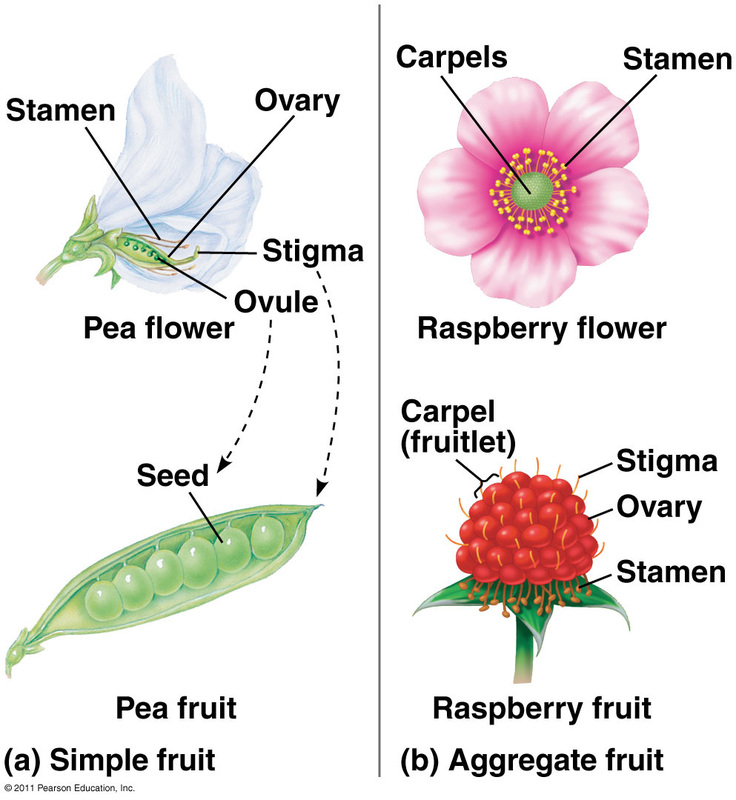 Aggregate fruits develop from several ovaries of free carpels in the same flower. An individual ovary develops into a drupe, achene, follicle or berry. An aggregate of these fruits borne by a single flower is known as an etaerio. The aggregrate fruits are of the following types. A multiple of composite fruit develops from an inflorescence where flowers are crowded together and often fused with one another. It develops from hypanthodium inflorescence. It has a hollow or cup-shaped fleshy receptacle. A fleshy multiple fruit which develop from a spike or spadix inflorescence. The flowers fuse togather by their succulent sepals and the axis bearing them becomes fleshy and swolen. Eg. Pineapple (Ananas), Jack fruit (Atriocarpus), Mulberry (Morus). It prevents overcrowding & competition for limited resources. It allows the plants to have their seeds to land on suitable places for germination, thus increases the chance for the plants to colonize new areas. Wind dispersed seeds and fruits have a variety of adaptations which help them to be carried away by wind. Wings: Some seeds (Cinchona or Moringa) or fruits (Acer, Terminalia) develop one or more thin membranous wings to ensure their dispersal by wind. Censer mechanism: In plants like opium seeds are released in instalment through the pores present near the top of the capsule when the fruit is shaken by strong winds. This process is known as censer mechanism. Dispersal of seeds and fruits by water usually occurs in those plants which grow in or near water. Such seeds and fruits usually develop floating devices in the form of spongy or fibrous outer coats. They are protected from rotting due to the presence of a waxy coating. Lotus (Nelumbo) : Lotus has sponvy thalamus with fruitlets embedded in it.The thalamus floats in water stream. Fruits of coconut and double coconut (Lodoicea) have large fibrous mesocarp which helps them to float long distances in the sea without any injury. Some fruits when ripe burst open with a jerk so that their seeds are thrown apart. In balsam, mere touch causes the ripe fruit to explode suddenly and seeds are thrown out with a great force. Dry fruits of Ruellia, when come in contact with water, particularly after a shower of rain, burst suddenly with a noise and scatter the seeds. 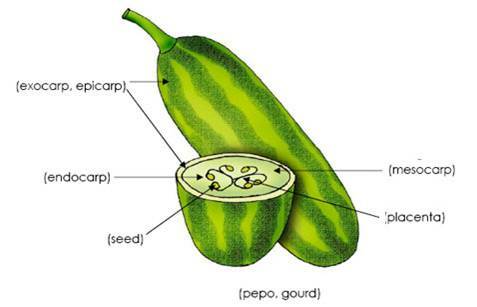 Mechanical dispersal of seeds due to build- up of internal pressure occurs in squirting cucumber. As the fruit mature, tissues around seed is converted into a mucilaginous fluid, due to which a high pressure develops inside the fruit. The tissue around the tip of the stalk breaks and the fruit is detached from the stalk. Due to this viscous substance comes out with seeds as a fountain.